Steve Bemiller visited the Delaware County Historical Society earlier this month to help guests figure out the answer to a common question: Is it a valuable antique, or is it just old? Bemiller, who recently retired after a 45-year career at Garth’s Auctioneers and Appraisers, gave a presentation Jan. 18 at the society’s Barn at Stratford in southeast Delaware. 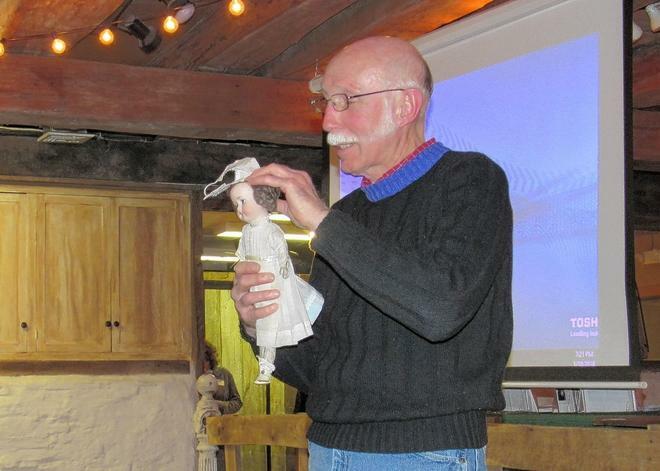 Bemiller reviewed items from the collections of audience members and the historical society, including antique dolls, pottery and household appliances. He said appraisers often glean clues about an item’s history from labels, trademarks and other easily overlooked information. “You always look for information on pieces, anything you can find,” he said. As an example, he discussed the various marks used on items imported to the U.S. from Japan. Bemiller said it can be more difficult to estimate the ages and origins of items produced before the passage of the McKinley Tariff Act of 1890, which required many items to be labeled with information about their country of origin. He said patent dates also can be helpful, although they often simply identify the earliest year the product could have been made. “In the antique world, you always have to talk ‘circa,’ ” he said. Bemiller said many items, such as crystal stemware, fancy linens and silver-plated service sets, once were seen as valuable heirlooms. He said younger generations are less likely to use or display such items, which has led them to drop substantially in value. “You ask me about value … it has educational value,” he said. The value of items also can hinge on their regional significance. For instance, Bemiller said chairs produced in the late 1800s or early 1900s by the Delaware Chair Co. will sell much better in central Ohio than in a different region. Bemiller said often in his career, he was approached by people who wanted to know more about their family heirlooms and said they did not care about their monetary value. He said he would offer his take on the item’s history, then inevitably wait for the follow-up question: What’s it worth? “They still want to know what it’s worth, even though they said they didn’t,” he said.